My next entry of my 365 Days of Manga winnings is the manga Orochi: Blood. Which is special... Why, you ask? Because I honestly liked this one. 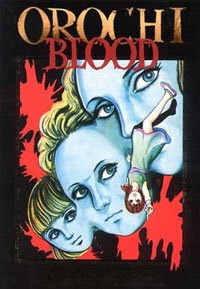 This is an interesting little title, as far as I can tell it was Kazuo Umezu's first work to be published in English. Like some other Viz titles at the time though, only some of manga was ever publish. It works out well enough though, Blood is a self contained story, so the reader is not left hanging. Though after reading it I would really like to read the rest of the series. Orochi: Blood is a horror story with some fantastical elements in it. It never goes to far though, it felt grounded, and had the right amount of creepy tension. The horror is mostly based around family issues and child abuse. Which makes it sound more like a Lifetime movie. Though this Lifetime movie has an immortal girl watching over the characters to just see what happens next. (Immortal Stalker Girls! Up Next on Lifetime.) This immortal girl is our titular character Orochi, who acts as both a character and seemingly omnipresent narrator. She sneaks in and around the dark mansion of a well-to-do family. Orochi watches as the Mother mentally and physically abuses her youngest daughter either for not living up to family standards, or her older sister. At first it seems the sisters have a wonderful relationship and that what is keeping them going, but as the story goes on the things they both do seem more suspicious. Part way though the story the plot curves and Orochi turns from being the narrator to a character with a role to play. By the second half of the story the younger sister is forced move far away. At some point Orochi goes to check on her and during this time saves her life but at a price. It seems Orochi must take long bouts of sleep every hundred years to continue to be immortal and young. The shock from saving the younger sister forces her to sleep early. She wakes up to find herself in the body of a different young woman (I'd insert a Lost Highway joke if I had one) who as it happens to be just adopted into the same family she had been watching over previously. It is a cheap plot device but it works as it doesn't seem out of place in the context of the story. The sisters are much older now, the eldest is bed ridden with a heart problem, and the younger sister now runs the home. For a time everything seems peaches and cream, but that is soon crushed. The younger sister repeats the cycle of abuse and begins to put Orochi though all sorts of torture. Orochi and the older sister being to bond heavily but this leads to the downfall of everything. This is where we learn that Orochi really wasn't an omnipresent narrator, as one might have though. Leading the reader to believe they might have been missing part of the story the whole time. This story really sent home the messages that abuse only begets more abuse, and that not everyone is what they seem to be. In the end it might all still sound a bit Lifetime-ish but the story really had a Twilight Zone feel to it. What helps to make this manga creepy though is the art. The art in this is wonderfully creepy. If you have seen the works of Junji Ito, the art has very similar style. 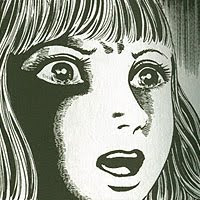 Though Umezu was probably writing horror long before Ito was even a spiral in his mummy's tummy. In fact it's pretty easy to see that Umezu had to have been a huge influence on Ito. Though the art in Orochi: Blood never reaches the grotesque level that some Ito comics reach. In terms of the story telling, the art, is very effective. Much of the story takes place in a large western styled mansion but the art makes great use of chiaroscuro. Many of the scenes are done in such a way that only part of it is lighted. While, often large, amounts of it remain dark or blacked out. I could feel the claustrophobic feel of being trapped. Which magnificently reflected what was going on in the story very well. The comic felt very Baroque in style, I could differently see the influence. The second half half the comic didn't seem as dark in terms of layout. The layouts do make significant change though. Early on in the story as we learn the young sisters plight there is never more then four panels to a page. Once certain events unfold you start to get pages with ten or even more panels. Giving the impression we are only seeing small parts of the whole picture. I really felt this title made great use of layout and panel as part of the story telling experience. 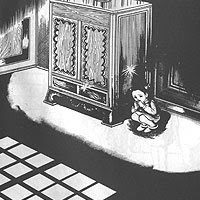 I really liked this manga, it has made me much more interested in reading Umezu's other works. I couldn't recommend Orochi to everyone. Though if you like the Japanese slow burn style of horror or the Twilight Zone it is very worth a read. Also if you are a fan of Junji Ito it should be a must read just to see the influences.